Eric is right that if the balance of power in the federal courts changes dramatically, liberal constitutional theories that focus on the courts will make a comeback, as will the work of earlier Warren Court defenders like John Hart Ely and Ronald Dworkin. Who knows? Perhaps Laurence Tribe-- or his appointed successor--will take up his famous treatise once again. I should point out that my own conversion to originalism in 2006 (published in 2007) is orthogonal to the judicial restraint/judicial engagement debate. I always regarded this debate as not very helpful, precisely because I have always believed that whether courts should intervene in any particular case, and how they should intervene, depends on the nature of the constitutional interests at stake. If the best interpretation of the Constitution requires a certain kind of judicial review, then judicial review is appropriate as a matter of judicial duty. If not, then not. (I note that many of my conservative friends who are arguing for judicial engagement have reached pretty much the same conclusion.) There is plenty of room for the political branches (and social movements) to play a role in shaping constitutional culture without taking away the power of judicial review. 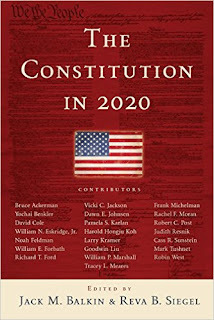 Reva Siegel and I began working on The Constitution in 2020 in 2005, during the Bush Administration, when it seemed as if conservatives would rule the country and the courts forever. We chose 2020 because it was far enough away that we could imagine the world being different. It was also a play on 20-20 vision, that is, clear vision about the Constitution. The book finally came out in 2009, at the very beginning of the Obama Administration. We did not expect that an opportunity for change would occur as quickly as it has. The book now seems more relevant than on the day it was published. I recommend its essays-- written by a very distinguished group of scholars--to anyone thinking about the Constitution's future. As an edited collection, it reflects the views of many minds, and neither Reva or I would agree with every essay in all respects. I would offer two caveats to Eric's prediction. First, liberal support for judicial review never really went away among many parts of the liberal intelligentsia. Many older liberals and many younger scholars, like Justin Driver at Chicago, remained true believers. So most liberals won't have to do much flipping at all. Second, you can't talk about judicial restraint and judicial engagement without thinking about the Supreme Court's docket. For Eric's prediction to come true, there will have to be a very significant shift in the agenda before the Supreme Court. That will take some time. If you look at the Court's current docket and the issues that it is called upon to decide, you will see that it reflects the conservative majority's concerns, and (putting criminal procedure questions to one side) it is generally shaped so that using judicial review will result in conservative victories. A large number of questions that have been teed up by conservative public interest law firms and decided by the conservative Justices have employed judicial review to strike down laws. These include federalism decisions, attacks on affirmative action, and first amendment decisions. in the areas of commercial speech, campaign finance, and labor law. In all of these areas, liberals have argued for judicial restraint, not judicial engagement, and I expect that this stance will continue, at least with respect to these questions. To the extent that liberals bring cases designed to change the law in these areas, they will continue this stance of advocating judicial restraint. For example, liberals who want to scale back decisions like Shelby County v. Holder, Citizens United, Sorrell v. IMS Health, or Harris v. Quinn, would argue for judicial restraint, not for judicial engagement. Of course, most of these issues were placed on the Court's agenda by conservatives. They depended on the assumption that conservative Justices would exercise judicial review to promote conservative constitutional values. If the Court has a liberal majority, however, that majority will have a greater say in determining the Court's docket in future cases. It is likely that the future docket will contain a different set of issues teed up by liberal public interest firms as opposed to the conservative public interest firms who dominated in recent years. Conservative public interest firms will bring fewer cases to the Court because they will be afraid of producing bad law (Liberal public interest firms learned to be cautious in the same way as the federal courts turned conservative in the 1970s and 1980s). The new docket, shaped by a liberal majority, will present new occasions for the exercise of judicial review. In these future controversies--but not the older ones--liberals may well argue for judicial engagement while conservatives argue for judicial restraint.